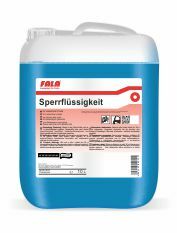 FALA Barrier Fluid is a barrier fluid for siphons of waterless urinals. The product is not soluble in water and forms a barrier that prevents that odors get into the room air. Additionally perfumes lead to a pleasant fragrance. Product is dyed blue for better identification. Cleaning is only as a part of maintenance needed. 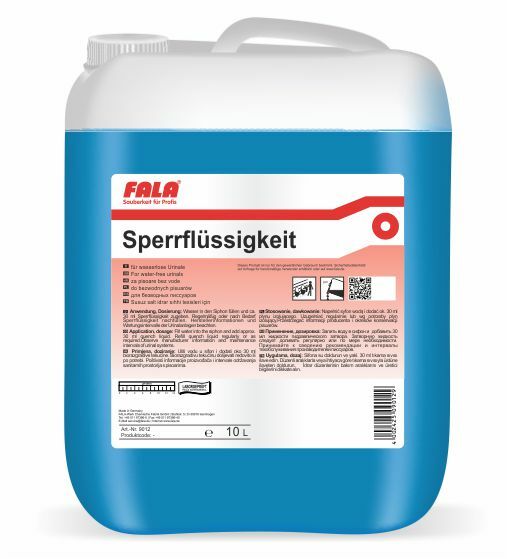 FALA Barrier Fluid is compatible with materials and non water contaminating. A liquid cleaner of high viscosity for toilets. Removes all soilings such as deposits of lime or urine from toilet bowls and urinals. Leaves a pleasant scent. Viscous cleaner for cleaning toilet bowls. Based on citric acid. Dissolves strongest soilings like lime and urine stone from toilet bows or urinals.